a y-axis which runs vertically. 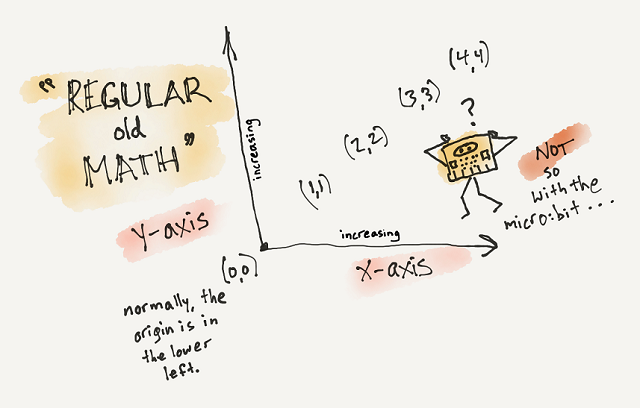 These two axes meet at a point called the origin where both the x and the y values are zero. On this basic coordinate grid, the origin is in the lower left corner of the grid and has the coordinates (0,0). The first value in a coordinate pair is the x value and the second value in a coordinate pair is the y value. A simple way to remember which value comes first is to remember their order in the alphabet. The letter x comes before the letter y in the alphabet and the x coordinate comes before the y coordinate in a coordinate pair. 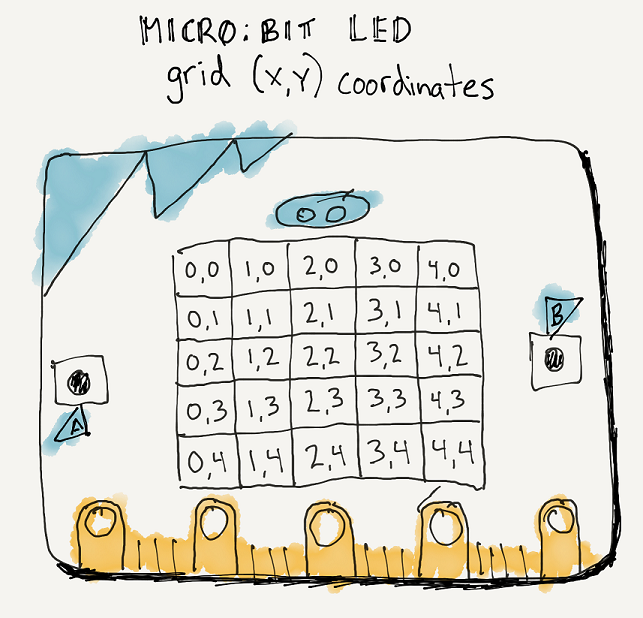 The 5 x 5 grid of LEDs on the micro:bit represent a coordinate grid with a horizontal x-axis and a vertical y-axis. It has an origin and you can refer to the position of the LEDs with coordinate pairs. the origin (0,0) is in the top left corner. the values of the y coordinates range from 0 through four and increase from top to bottom. The values of the x coordinates range from 0 through four and increase from left to right just as they do in the coordinate grids used in math class. 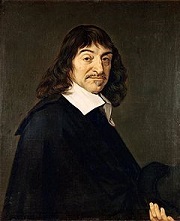 René Descartes (1596-1650), was a French philosopher and mathematician who developed the coordinate system we use today. A story goes that while lying in bed, he noticed a fly on the ceiling. In wondering how he could describe the fly’s exact position on the ceiling, he decided to use a corner of the ceiling as a reference point and then describe the fly’s position as a measure of how far away from the reference point one would need to travel horizontally and then vertically to reach the fly. His coordinate system proved useful in many ways including creating an important link between the studies of algebra and geometry. Geometric shapes could now be described by points on a coordinate plane.